Learn how to tune drums from drum teacher Jason Gianni in this Howcast drum video. What I&apos;d like to talk to you about right now is the general idea of tuning a whole drum set and how it refers to different styles of music. Tuning is an art form within itself. 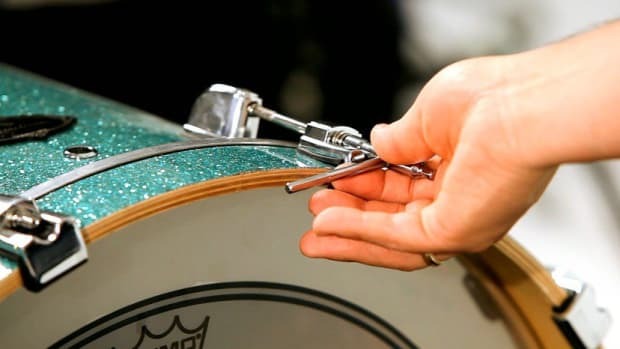 You have to know some of the systems of tuning and how to make it sound better on each one of your drums. I&apos;m going to go through that a little bit now. Generally, on an overview of tuning, if you&apos;re playing in more rock oriented style, typically, not always but typically, you want a little bit of a higher pitched snare drum and medium to lower pitched toms, with a low pitched bass drum. You want more of a punchier sound from these drums. A little bit higher sound from these drums. If you are leaning toward more of a jazz style, it&apos;s typically the opposite. Where you lower your snare drum a little bit more and you raise the pitch of everything else. Your toms will be cranked a lot more and you really bring up your bass drum. Tuning also has to do with the size of the drums, too. In rock drums, you&apos;re going to have bigger drums. A bigger bass drum, longer and wider, or bigger in diameter toms, and usually a deeper snare drum, about six and a half inches deep or what this is, which is a five inch deep snare. And with jazz, you&apos;re going to have typically more shallow drums or smaller drums. An 18 inch base drum, some smaller diameter toms, sometimes a smaller diameter snare drum or a smaller in depth snare drum. So every bit of tuning that you have to do really coincides with the size of the drums, in addition to the type of heads you use. With rock you&apos;re going to use more clear heads and sometimes a two-ply head which is two layers of a head. Whereas in jazz, sometimes you use a single-ply, one ply head so it rings a little bit more and you get a little bit more of a twangier sound. In addition, you want to make sure you have a drum key. And a drum key usually fits right over a tension rod, like so. And it works the same as a normal screw which would be righty tighty, lefty loosey. And there&apos;s ways of tuning the bottom versus the top. Typically in a rock style you&apos;re gonna have a tighter bottom head and a looser top head, to have that depth of sound with the sort of length of tone after. And in jazz, you&apos;re going to really bring up both heads to have that twangier, more open drum overall. So if you do a little research on the different styles of tuning, you&apos;re going to fit that style a little bit more.